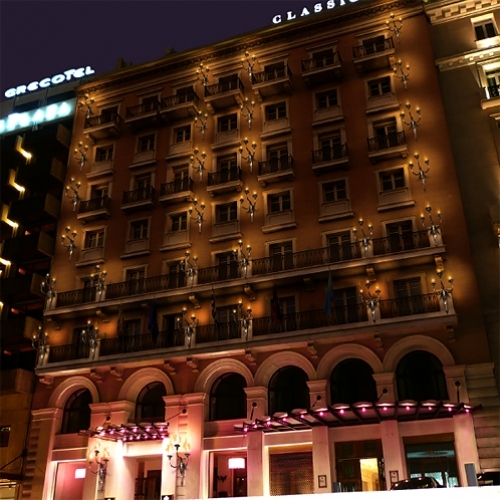 Set in the heart of Athens, in the vicinity of Hotel d’Angleterre and the House of Parliament, King George II Hotel enjoys a perfect location. Considered a historical landmark, it deserved an elegant lifting to restore its uniqueness. I therefore opted for a specific lighting inspired from the classic English and French houses of the 18th century in which bronze wall lamps (or candelabra) were hung to create a tasteful candlelight halo. Searching into the Louvre’s archives, I found a pair of 18th century bronze lamps : in the shape of woman body, the subtleness of the curves in a “à la Grecque” style made it the perfect match. Once modernized and reproduced in aluminium with bespoke bulbs, I would line them up vertically on the façade, to give the building a true presence, and the facade a real character.